NATTY yellow carts whizz tourists around Wenchang space port, a sprawling launch site on the tropical island of Hainan. The brisk tour passes beneath an enormous poster of Xi Jinping, China’s president, then disgorges passengers for photographs not far from a skeletal launch tower. Back at the visitor centre there is a small exhibition featuring space suits, a model moon-rover and the charred husk of a re-entry capsule that brought Chinese astronauts back from orbit. A gift shop at the exit sells plastic rockets, branded bottle openers and cuddly alien mascots. 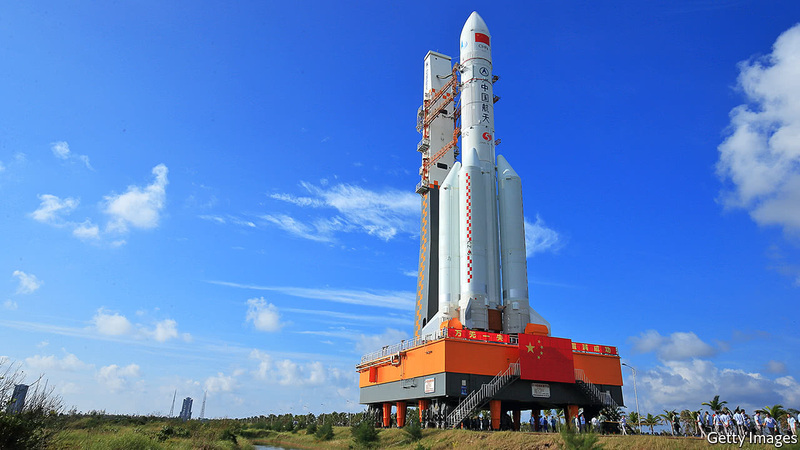 The base in a township of Wenchang city is the newest of China’s four space-launch facilities. It is also by far the easiest to visit—thanks in part to the enthusiasm of officials in Hainan, a haven for tourists and rich retirees. Wenchang’s local government has adopted a logo for the city reminiscent of Starfleet badges in “Star Trek”. It is building a space-themed tourist village near the launch site, with attractions that include a field of vegetables grown from seeds that have been carried in spaceships. If the dream is to turn this palm-fringed corner of Hainan into a tourist trap comparable to Florida’s balmy space coast, there is still a lot to do. Several idle building sites suggest that some investors have gambled rashly. Signs have been taken down from a patch of scrub that was once earmarked for an amusement centre. On a recent weekday, pensioners wintering nearby were among the few visitors to the launch site. A local says that people often come out feeling like they have had a lesson in patriotism, but not much fun. Perhaps this will change when Wenchang gets up to speed. The base is crucial to China’s extraterrestrial ambitions because it is the only site from which it can launch its latest and largest rocket, the Long March 5 (pictured). Narrow railway tunnels limit the size of the components that can be delivered to the three other bases. Rockets are anyway more efficient the closer they are launched to the equator, where the faster rotation of Earth provides extra lift. Of China’s launch centres, Wenchang is by far the nearest to that sweet spot. The Long March 5 can carry about 25 tonnes into low orbit, roughly double the maximum load of China’s next most powerful rocket. This is only a bit less than the biggest rocket currently used by America’s space agency, NASA, can carry—but far less than the Falcon Heavy, a behemoth being developed by SpaceX, a private American firm (see article). The Long March 5’s maiden launch, in 2016, was a success. But the second one last summer failed a few minutes after lift-off. Wenchang’s two launch pads have stood empty ever since. That failure, and another one last year involving another type of Long March rocket, slowed China’s space efforts. Officials had hoped to launch around 30 rockets of one type or another in 2017 but only managed 18 (there were 29 launches in America and another 20 of Russian ones—see chart). But they promise to bounce back in 2018, with 40-or-so lift-offs planned this year. These will probably include a third outing for the Long March 5—assuming its flaws can be fixed in time—and missions that will greatly expand the number of satellites serving BeiDou, China’s home-grown satellite navigation system. The next two years could see big progress in China’s two highest-profile civil programmes in space: lunar exploration and building a space station. In 2013 China sent a rover to the moon’s surface, the first soft landing there since Russia and America discontinued such efforts in the 1970s. Towards the end of this year China hopes to put a robot on the far side of the moon, a region never yet explored from the lunar surface. That landing will help preparations for an attempt—tentatively planned for 2019—to collect rocks from the surface and return them to Earth. China talks of launching the main module of a permanent space station as soon as 2019, and expanding it with two bolt-ons early in the following decade. It is going it alone with this programme. America passed a law in 2011 that forbids NASA from sharing knowledge or resources with its Chinese equivalent. This ensured that China remained locked out of the International Space Station; America was never keen on letting it in because of the military uses of China’s space programme. China has instead experimented with two temporary orbiters of its own, the newest of which it crewed for a month in 2016 (the older one has reached the end of its mission and looks likely to tumble to the Earth sometime in the next few months). Eventually, China would like to send its taikonauts to the moon. There is no target date for achieving this, but in 2016 an official speculated that a Chinese citizen might step on the lunar surface within 15 to 20 years. The country has Mars in its sights, too. It plans to land a rover there in 2020 or shortly thereafter. It wants to retrieve rocks from Mars sometime in the 2030s. 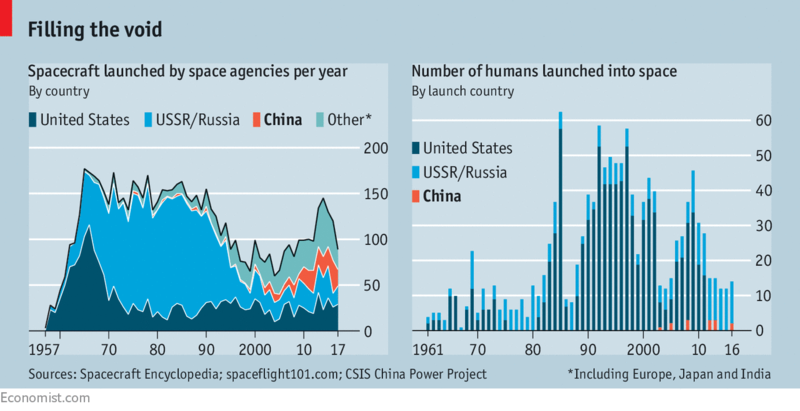 China still lags far behind America in its space accomplishments, but it does not appear bent on a cold-war-style race. It spends far less on its civil space programme than the $19.7bn that NASA was allocated last year. China is doggedly pursuing its goals, however. Joan Johnson-Freese of the US Naval War College compares China to Aesop’s tortoise. One of the Communist Party’s aims is to boost national pride at home. In 2016 Mr Xi declared that April 24th would be celebrated annually as “space day”: it is the anniversary of China’s first satellite launch in 1970. 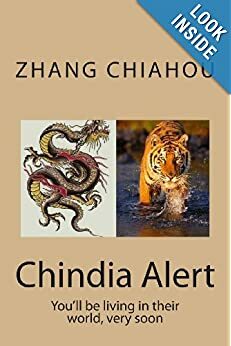 Even if outshining America remains a distant goal, China is mindful of the progress being made by India, another big developing country that dreams of the stars. India is planning its first soft-landing on the moon in March, more than four years after China’s. Europe is keen to collaborate. Chinese and European scientists launched their first joint satellite in 2003. They are now co-operating in a study of solar wind. Astronauts from the European Space Agency (ESA) recently trained with Chinese counterparts in survival skills. Karl Bergquist, an ESA official, says a few European astronauts are learning Chinese to prepare for possible joint missions. 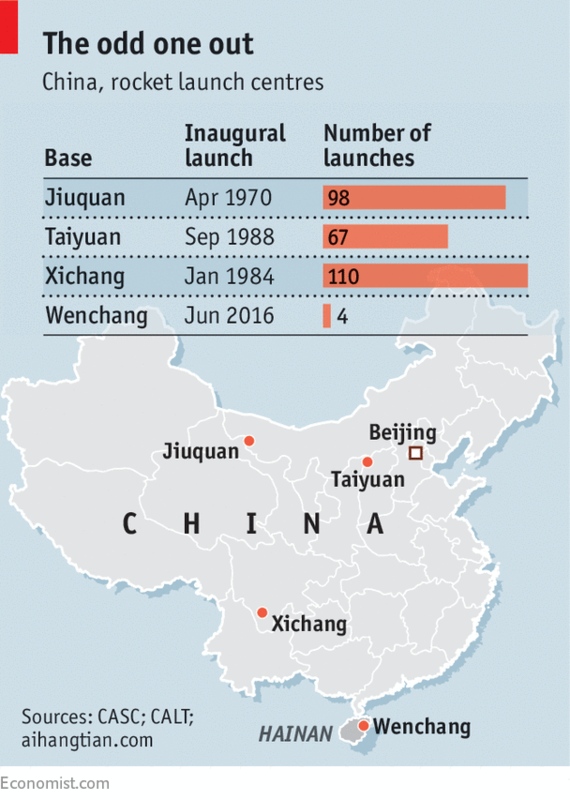 But America’s worries are growing about the military aspects of China’s space programme. Marco Aliberti of the European Space Policy Institute in Vienna says this has been particularly evident since 2013, when China showed it could launch projectiles into the lofty orbits traced by America’s most sensitive satellites, suggesting it was developing an ability to knock them out. Many American scientists favour a more relaxed approach. But in an era of “America First”, the chances are slim of NASA being allowed to befriend China. All this rankles among Chinese officials. They note that tense relations between America and Russia have not prevented those two countries’ space agencies from working together (since retiring the space shuttle, America has been dependent on Russian rockets to get astronauts into space). 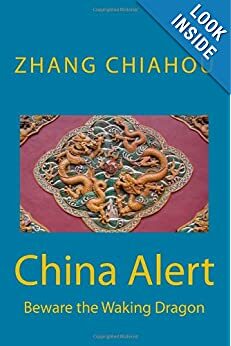 As many people in China see it, America’s behaviour is further confirmation of a long-held belief that America wants to create impediments to China’s rise. Jiao Weixin, a space expert at Peking University, says America is locked in “cold-war thinking”. If American authorities do not wish to work with China, he says, there are others who will.